I'm sorry for being a bit late with this message, but yesterday we had kind of a long day!!! We are happy to tell you that we summited Chimborazo under challenging conditions, then made a safe descent to our high camp and then down to the hut, and then drove from the base of the mountain to the beautiful sub-tropical town of Baños. What a day! We made a high camp, as I previously mentioned we might to. On summit morning, we woke up at around 2am, but seeing that the weather was clear and very cold, we decided to leave a bit later than usual. We had this option open to us because we established such a high camp – it was at 5300 meters / 17,400 feet – definitely higher than normal and making our summit day a little shorter. We wanted to wait a little longer to avoid the coldest temperatures of the night and get the benefit of the sunrise and its warmth before being extremely high on the mountain. After a light breakfast we were ready for our climb! It was wonderful to have the clear skies, and we were fortunate to have just a light wind. We left camp at around 3:15 am and found the climbing condition in the first hour of our ascent a bit difficult due the snow conditions: a thin crust and sugary snow make our progress a bit slow and hard. Once we were on the ridge, conditions were better in the snow pack, but it was still very cold at about -10°C or 14°F. We stopped a few times to add extra layers, as well as for snacks and drinks. After a short break we took a couple of pictures and started to head down. The descent was easy due the cold conditions. We had good footing on the snowpack the whole way. Once in high camp we rested for abut an hour and waited for our porter who was s great help to us in aid in load carrying to and from the high camp. Driving to Baños was kind of long journey after the climb, but we didn't care, since we knew there was showers, lots of rich air (! ), and great food!!! So we are relaxing in the beautiful town of Baños on a river that created an access valley to the Amazon Basin. There palm trees add lots of flowers in turn, so it feels truly refreshing and in contrast the the alpine zones where we have been spending a lot of our time. After an easy afternoon, evening, and morning here, we will leave for Quito where we will have our final dinner together before saying good bye for now. We are very happy. What a great way to end our trip – with the summit of Chimborazo! Jonathan, Sandee and Jaime on the summit with smiles! Jonathan and Sandee celebrating their summit success! We attempt Cayambe Saturday night, but the weather stopped us. We had great hopes for this climb because the forecast was showing low winds and mild temperatures, but everything changed on the mountain!!! We left the hut in the middle of high winds. They were blowing all night, and we want to give it a try in case conditions got better as we got closer to the morning. We made it to the glacier but that was it. The winds were just too high. I have to say, each member of our team worked really hard and did a great job coping with the winds. They were great. But because we saw no signs of improvement with the weather, we knew the route was not at all practical that day. We stayed warm, but that would have been much harder to accomplish high on the mountain where the winds were undoubtedly worse. After the climb we had some more food and a nap and then headed back to Quito in the early afternoon. And last night we had dinner at a local food restaurant, Mama Clorinda, and my daughter Tamia joined us!!! It was a lot of fun. The restaurant offers some traditional Ecuadorian food, so it's fun to sample some unusual dishes. They do a great job! Now we are driving (with Sandee and Jonathan) towards the hut on Chimborazo, (Hermanos Carrell), and we are planning to do an acclimatization hike tomorrow. And there's a chance we will do some ferrying of gear to a high camp to make our summit day shorter and easier. This is a huge mountain, so sometimes that is worth the effort. If we do that, we will move up to the camp on Wednesday and climb for the summit on Thursday. As you know, phone reception can be poor over there, so, it's most likely that you will hear from us on Friday night!!!! We are hoping we will have some good news for you along with a summit pic!!! The Internet and cellular transmissions have been very difficult down here, and I’m sorry not to be able to reach you earlier. Here below are some photos of Fuya Fuya. It was an easy hike of a good length, and we enjoyed it! Mostly is was walking and a little scrambling higher up, but we used a rope for protection on the last part just below the summit. It was a little windy once again. We had some good views, especially of the lake below us and across some beautiful flowing grasslands that are typical of this area. After the climb we went back to Otavalo where we stopped for lunch at a nice pizza and sandwich place. We were all very hungry!!!! We went back to our hotel, and after a shower and a short nap, we went out to have dinner in a kind of Italian-Ecuadorian Restaurant. The food was really good, everyone agreed!!! Now, we're having breakfast and about to leave La Casa Sol. Everyone is in good spirits and ready to go back to Cayambe, where we hope the weather help us this time. We’ll be back in touch on late on Sunday the 9th or on Monday. Three of us heading up towards Fuya Fuya. A second view with two of us far left and another lake way below us. On the summit of Fuya Fuya and great to be there! We are back in town after a very windy night at the hut on Cayambe! We didn't leave the hut at all because it was way too windy. We woke up at 11 pm according to our plan to eat a breakfast and begin our climb at midnight in order to have the coldest conditions possible on the mountain for good cramponing on the glacier. When we went to bed it wasn't bad outside, but as time passed, the wind started to blow harder and make an interesting howling noise that keep us awake for a while. So as planned, we woke up at 11pm and went out to check the weather, knowing beforehand that wasn't good. Jonathan joined me and agreed the wind was too much to begin the climb. Back inside, we discussed the conditions and decided to wait for two hours to check again and make a final call. After the two hours the wind keeps blowing and howling, and we had another good conversation with Jonathan, Sandee, and Calvin, along with Marco the assistant guide. In the end, we all agreed that climbing in those conditions wouldn't be easy and would most likely be very uncomfortable. We could go up a little ways to see how the team deals with the challenging conditions and see if anything changes, but there was a consensus among the climbers that they were there to enjoy themselves, not to prove they could be miserable and still be OK. So we went back to bed after officially deciding to do a "Plan B". Besides going back to bed at 2 am (a very nice idea), the second part of "Plan B" was to not return to Hacienda Guachala but instead to stay at La Casa Sol just outside the town of Otavalo. So after breakfast at the normal breakfast time, we drove down from the Cayambe highlands and stop for a short hike to Peguche waterfall. 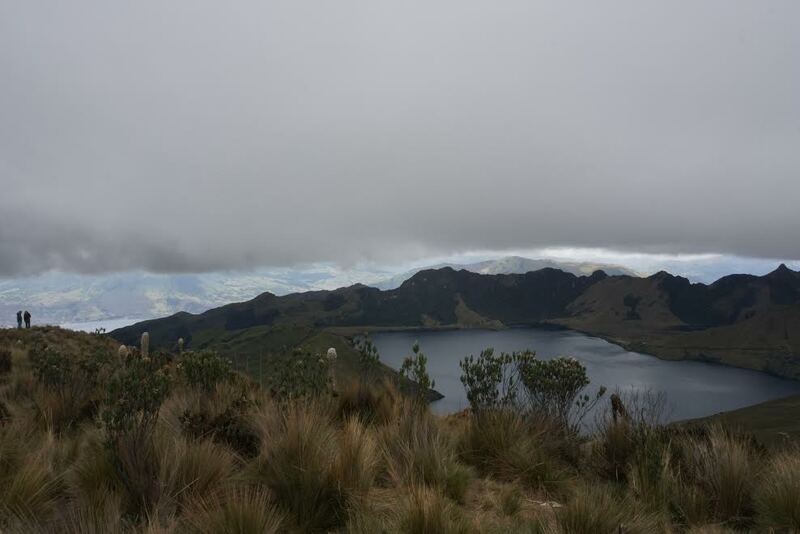 After that, we continued on down from the highlands towards Otavalo and La Casa Sol. Long story short, everyone kind of feel in love with the place. It is beautifully designed and a very comfortable place to relax. Outside our rooms at La Casa. Part 2 of "Plan B" is climbing Fuya-Fuya tomorrow. At about 14,000 feet, it’s just a small peak by Ecuador standards, but it will keep us moving and acclimatizing, plus we hope to have some nice views of Lake Mojanda and Cayambe. 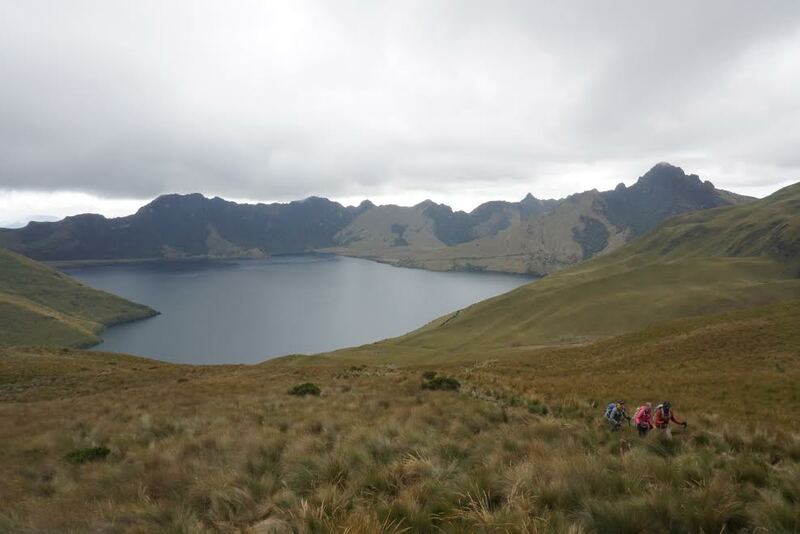 Part 3 of our "Plan B" is going back to Cayambe with the hopes of having better weather and making the climb. This time of year the weather is normally good, so we have reason to be optimistic. We’ll call Sunday or Monday and let you know how everything goes. PS: Below are some photos from earlier in the trip. Up in the clouds on the summit of 15,413-foot Rucu Pichincha (Jonathan, Sandee, Calvin, Jaime). Calvin, Sandee, and Jonathan on our acclimatization hike on Cayambe. We’re looking forward to being on the glacier in the background when we return! Everything is going well down here, and we are enjoying Ecuador a lot. There is wonderful scenery everywhere we go and beautiful mountains. The physical workout is harder than I expected, but it's been fun. From the hiking we've done so far, I am already in better shape and feeling good. Our first big hike and scramble was on Pasachoa (13,776 ft), and though it was a work-out for me I really enjoyed it. It's beautiful countryside and we saw almost all of Ecuador's big peaks very clearly. It was a beautiful day and the views were remarkable. 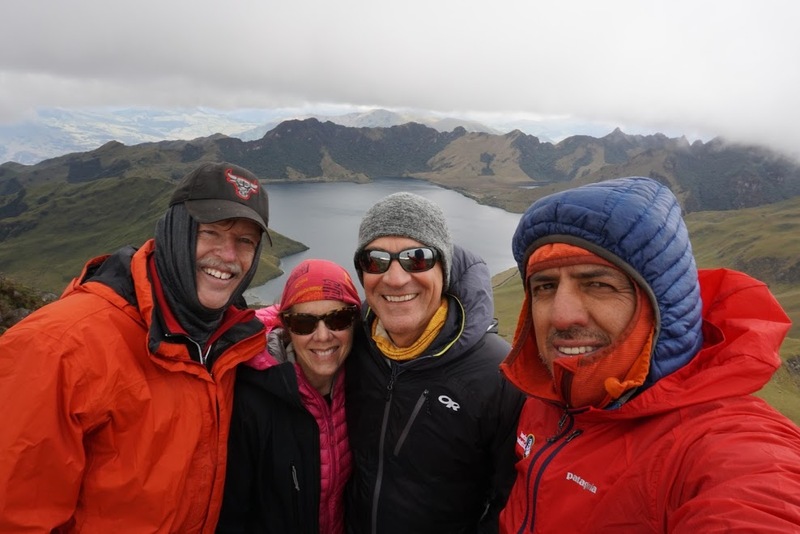 We also had a good time on Rucu Pichincha (15,413 ft). There was more scrambling on that peak. We had good views at first but then climbed up into the clouds or fog and our view was blocked. We're at Hacienda Guachala now below Cayambe at 9199 ft. It's a very comfortable place and the food's been every good. Pretty soon we will leave and head up to the hut on Cayambe, which is our first big climbing goal. We'll work on skills on Wednesday and make our summit on Thursday. Jaime says we're going to make a stop at a local store from some snacks and then in a few hours, we'll be up at the hut at an elevation of 15080 ft. We'll call in a couple of days with an update.